Katsuhisa Yoshikawa　Chair, JATA Domestic Travel Promotion Committee. 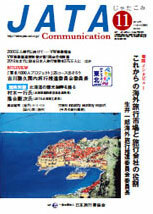 Copyright (c) 2012 Japan Association of Travel Agents. All right reserved.